Did you know you can retrieve status messages from ConfigMgr, including the message descriptions, using PowerShell? I pieced together some code I found on the internet with some of my own code, and came up with the following script. Essentially, it’s the equivalent of running the “All Status Messages from a Specific System” from the status message queries in ConfigMgr. You can return results either into the console, CSV file, or to the PowerShell GridView for a more authentic “Status Message Viewer” feel. The script works by running a SQL query to the ConfigMgr database to retrieve the status messages (you need “db_datareader” access to the database with your logged-on account). But the message descriptions themselves are not stored in the database, so to retrieve them we will talk to the ConfigMgr message DLLs. These DLLs can be found on your site server, and contain the message strings to go with the message IDs. You could add additional SQL queries in the script to return the kind of results you want to see, and call them using a parameter, to extend the capability of the script. the "All Status Messages from a Specific System" Status Message query. The results will be returned to the console by default, unless the CSV or GridView switches are used. The number of hours past for which to retrieve status messages. Default is 7 days. The location of the "smsmsgs" directory containing the "srvmsgs.dll","provmsgs.dll" and "climsgs.dll". The standard location is used as the default. Returns to the console all status messages for the system "PC001" in the last 7 days. Returns to a CSV file all status messages for the system "PC001" in the last 7 days. Returns to PowerShell's GridView all status messages for the system "PC001" in the last 24 hours. [string]$SMSMSGSLocation = "C:\Program Files\Microsoft Configuration Manager\bin\X64\system32\smsmsgs"
$StatusMessages | Out-GridView -Title "Status Messages for ""$ComputerName"" in the last $TimeInHours hours"
In a recent post, I described different ways to translate error codes for Windows and Configuration Manager into their friendly descriptions. In this post, I will show you how to create a SQL database of known error codes and descriptions that you can join to in your SQL queries, to help simplify your troubleshooting, and I will also give some example queries you can use with Configuration Manager. Windows and system error codes are standard and are published by Microsoft on MSDN, but there is no published resource of error codes for Configuration Manager 2012 onwards that I know of. 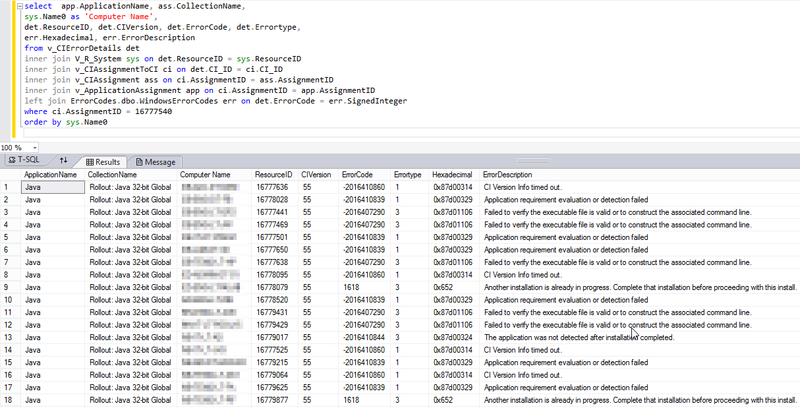 To have a database of all these codes is quite useful as they are not stored either in WMI or in the ConfigMgr database – only the error codes themselves are stored. These codes are translated to their descriptions by the ConfigMgr console and the ConfigMgr SSRS Reports probably utilizing dll files. I extracted a list of 11,839 error codes and descriptions using the SrsResource.dll, as described in the previous post, and exported them into a csv file. Using the PowerShell function below, I converted each error code to give the hex and decimal codes for each. In Configuration Manager, the log files and reports tend to use the hexadecimal value or the ‘signed integer’ decimal value for the error code, however WMI stores the codes as ‘unsigned integers’ (always positive or zero), therefore I have included all three for easy referencing. To import those codes into a SQL database, first download the attached XLSX file which contains all the codes, and save it in CSV format. The error descriptions have had any line breaks removed so that they will import correctly. Now run the following T-SQL code against your SQL instance. It will create a new database called ‘ErrorCodes’ and import all the entries from the CSV into a new table called ‘WindowsErrorCodes’. Change the path to the CSV file as needed. I’m using the same SQL instance as my Configuration Manager database so I can easily reference the two. If I want to query for application deployment errors, similar to the PowerShell script in my last post, then I can use the following query entering the AssignmentID of the application deployment, which you can find from the ConfigMgr Console in the additional columns. I will join the app deployment errors by their error code to my new database to return the error descriptions for each. 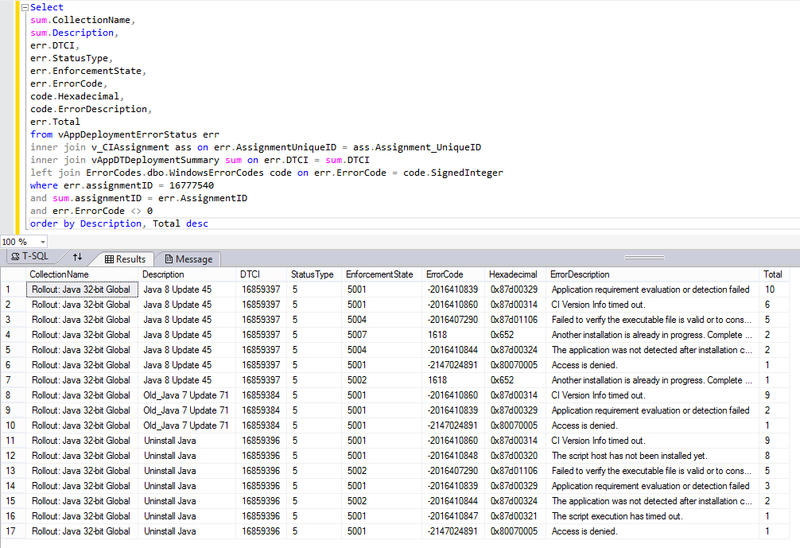 Join the ErrorCode field from the ConfigMgr database views with the SignedInteger field from the error code database.